Taiwan night markets are world famous for their food and crowds. Stroll through the best Taiwan Night Markets have to offer with this gallery. Jiufen (Jeoufen), Taiwan, is a beautiful historic village, set in the set on the east coast mountains. It's full of tea houses and has a quaint old street, popular with tourists and locals alike. Photographs of Taipei 101 and the Taipei City Skyline. Many of the photos in this gallery are taken from the nearby mountains (Elephant Mountain, Tiger Mountain and Yangmingshan). Travel photography and portraits from Tibet. Including the culturally Tibetan regions still found in China's Sichuan, Yunnan, and Qinghai Provences. Travel and editorial photographs from Burma (Myanmar). This large archive of images features the culture of Burma. 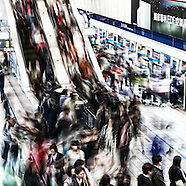 Travel and editorial Photography from Japan. A large archive of images featuring the people and culture of Japan. Travel photography from India. This large archived gallery features images from the diverse culture and people of India. Archived gallery of images from Cambodia. Travel and editorial stock photographs from Cambodia. Stock travel and editorial photography from Laos PDR. This large gallery of images features photos of the people and culture of Laos. Travel and editorial images from Nepal. This archive features photographs from The Himalayan Kingdom. The Taiwan Martyrs' Shrine is a popular tourist stop in Taipei. One of the main attractions is the hourly changing of the honor guard ceremony. The pre-opening ceremony for the 2009 Taipei Deaflympics in Taiwan. Colorful, artistic dancers and acrobats can be seen performing on cranes, helium balloons and in a bungee box. Keelung City, and the nearby Heping Coastal Park and Ershawan Fort are beautiful areas. Keelung is a busy port city with a bustling harbor and the crowded Miakou Night Market. Nearby are the Ming Dynasty era ruins of Ershawan Fort and the geologically amazing Hoping Coastal Park. Tainan is possibly Taiwan's most beloved city. It's packed with beautiful temples and an interesting and distinct culture. Modeling photography in Daan Park in Taipei, Taiwan. The Taipei Jianguo Flower and Jade Markets are beautiful places to buy inexpensive products. Photography from the Jokhang Monastery and Barkor Square in Lhasa Tibet. The Philippine island of Palawan is a remote and beautiful place. A bit off the tourist trail, it has friendly people and beautiful sites. Travel, editorial and portrait photography from China, Hong Kong, the USA and the Philippines. Photographs from Taiwan's highest mountain - Jade Mountain, aka Yushan. Taiwan's Snow Mountain (Xueshan) is a beautiful hike in the north of the country. Photography from Yeliu GeoPark and other locations on Taiwan's beautiful east coast. The Holy Ridge is one of Taiwan's most well known and difficult hikes. Danshui, Taiwan is known for its Old Street, Lover's Bridge, Fisherman's Wharf, Huwei Fort and Fort San Domingo. Teh Chung Tai Chan Buddhist Temple is located on the outskirts of Puli, Taiwan. Sanxia and Yingge are two towns in Taiwan located only a few kms apart. Sanxia is known for its old street and beautiful temple and Yingge is know for its Pottery Street and Ceramics Museum. Sun Moon Lake is a favorite weekend getaway for everyone living in Taiwan. It is a beautiful, scenic lake tucked into the Central Mountain Range.